You are at: Home » Sports » Blantyre derby is here: Who will come out top? Blantyre derby is here: Who will come out top? We are just a few hours away for Malawi’s two biggest football clubs will lock horns for the 2nd time this season in a league competition at Kamuzu Stadium as Big Bullets look to cement their place at the top of the Super League, with Mighty Wanderers aiming to gain some ground in the race for the title. The game will be the the third time that the two giants play each other, having met in the Carlsberg Cup final in August and as it stands Bullets has got one up having won the first league encounter 2-1. Having tested no defeat in the league so far and sitting at the top of the standings, Bullets certainly go into this game on the better form. Their last match saw them claim a 4-2 victory over Red Lions. The peoples team are yet to lose a game at home this season and they are unbeaten in their last six games. The team’s Technical Director Billy Tewesa had his say on the Blantyre derby. “It’s a tough match but we will give it all to claim all the three points. We lost to them in the cup final but life has to move on, this is a different game,” he said. Meanwhile, Wanderers go into this game having lost their opening two games in the second round. But it certainly doesn’t feel like Wanderers are in a place where that’s going to happen for them. They have collected nothing from their last two league games and conceded two goals and they are currently sitting on 7th position. The Nomads have struggled to find their title winning form so far this season no wonder they are 12 points behind the league leaders. But they will be hoping to continue from where they stopped in the Standard Bank Cup last week. Eliya Kananji, speaking about the derby said, “It’s hard but I am looking forward to it. We lost in the first round and we will be hoping to avenge that loss. The boys are ready to hand Bullets their first league defeat this season,” he said. 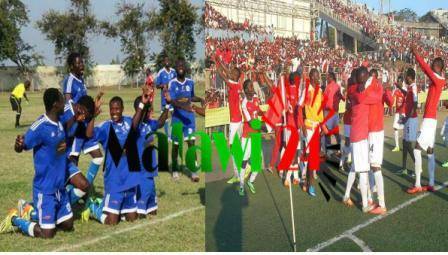 History favor Bullets at Kamuzu Stadium. For the past four seasons, the league defending champions have recorded back to back victories over their rivals. Beating Wanderers will see Bullets opening a 15 point lead over the Lali Lubani side but a victory for the Nomads will revive back their hopes of winning the title. The league leaders will be without Vincent Gona, Chiukepo Msowoya and Owen Chaima whilst Wanderers will be without Rafique Mussa, Jabulani Linje, Ishmael Thindwa and Francis Mulimbika. The match kicks off at 3:00 pm. While Bullets’s attackers take all the credit, their unsung hero this season has been Yamikani Fodya. He has improved defensively over the last couple of seasons and he has become the team’s second-best creator. His crosses and diagonals set up just as many goals as any other means of attacking that Bullets have, and Isaac Kaliyati will need to track him down. When a team plays a 4-4-2 against a 4-4-2, usually one of two things is going on. Either they believe their midfielders are so far superior to the other team’s that they dont need a third or they are not trying to control midfield, and are simply defending deep with two banks of four. If Bullets play this sytem against Wanderers, they will be able to contain the pressure from the Nomads. No matter how weak Bullets defense is, Isaac Kaliyati has to pick his poison. His pace is something else and can take down his opposition like nobody’s business. Bullets should tread carefully with this upcoming right footed winger. nyerere will win de game…. Ngakhale pandewu munthu amene amatokota kapena kuputa nzake amakhala kut sangamenye,ndye neighbour b carefull,nyelele zilibe chibwana zikiluma nkabudula. Nkhani ndi Maule, kupita chitsogolo. Bwinobwinotu, nthanga kunena anapisa likongwe la apongozi.Osangodikira 90 mins bwanji? MANOMA AND NYELELE 4 REAL. I just wish for a draw,…I wont like a win for either team. TIKUITIKITANSO GAME TODAY !! BB 4EVA!!! AMEN!!!!!!!! We dnt have to fool ourselves ppl, let 90+min seperate men 4rm boys! #Be_Forward_Nyelele till i die. umangozwira2 kt nd Maule omweo moto kt buuuuuuuuuuuuuuu. The plps’ choice (Noma) will win today no matter what. Chande, Fodya & Diverson Mlodzi on target! making it 3 : 0 in favour of BB. Ana achepaaa…! Nyerere zitenthedwa lero ndi candle wax, mawule ndikawa…Waaa…. ziwoneka after 90mins, pano udakali mmawa. Red devils all de way.? MAWULEeEEE!!!!!!!!!!!!!!!!! Ambuye tidalitseni ife maule kuti tiwine lero…amen!! men in red !! wining is our culture !